The loss of the port of Tobruk in the summer of 1942 stunned the British and worried the normally-optimistic prime minister like few other reverses had. The seesaw nature of the desert war had seen both sides alternately advance and retreat, but the Axis breaking of the Gazala line and the capture of Tobruk took the British forces in the desert by surprise, sending the remnants streaming for the Nile delta. Lost in the defeat were most of Eighth Army’s tanks and the equivalent of four infantry brigades, with several others so reduced in strength as to be useless. Axis losses were heavy as well, but victory convinced the Afrika Korps’ commander, General Erwin Rommel, that little stood between him and the British base at Alexandria. The Pyramids beckoned, and with only passing consideration of the state of his army and logistic situation he ordered an immediate pursuit of the retreating British. 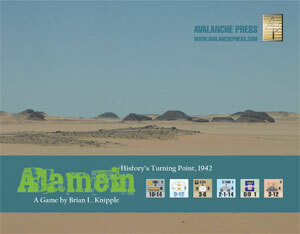 Alamein is a monster game covering the 1942 battle for Egypt from the end of June to the middle of October 1942. The game includes the battles that were fought in that decisive summer beginning with the 26 June Axis attack on the forward British position at Mersa Matruh and ending with the British offensive that drove the Axis forces west for the final time. Players can choose single-map scenarios of a few days' duration or the campaign game covering the whole nearly four-month period. Game scale is two kilometers per hex, units are battalions and companies, and three daylight and one night turn make up a day. Unlike previous games using its system, Alamein includes rules for airpower to support land operations. Also more than previous titles, the use of minefields is both large and critical to each side’s ability to defend. The game system is that used in the out-of-print Invasion of Italy, Red Steel and Red Parachutes, as well as the still-available Island of Death, but with additional campaign and formation rules. The military units are mostly battalions (600 to 1,000 men, 12 to 24 artillery pieces or 35 to 55 vehicles) operating as part of a brigade or regiment which is usually composed of two or three battalions. These brigades and regiments are grouped in twos or threes to form divisions, divisions in turn being groups in twos to fours to form corps. Units function at the divisional level, operating most effectively in company with other elements of their formation. Morale is an essential factor in addition to the standard attack and defense combat strengths and movement allowance. A unit's morale value reflects the esprit de corps of the formation. Morale is important in determining a unit’s combat effectiveness and will degrade as the individual unit suffers losses and the formation has more and more units at reduced strength. Combat in Alamein comes in three varieties. First is indirect fire (artillery), which can be used to assist an attack or defense or as a means of inflicting casualties and disorganization on the enemy. Artillery units are a player’s most versatile in that their strength can be applied to any hex within their two to 10-hex range. The second combat type is anti-tank, the means by which the defender attempts to destroy attacking tank units and (optionally) the attacker fires on defending tanks. Only units with anti-tank values may fire and only those with armor defense values may be fired on. The third and final combat type is general, in which the combat strengths of attacker and defender, modified by supply, terrain and the use of support units, are equated to odds on a combat chart. General combat is the only combat type that results in the forced retreat of enemy units and the occupation of enemy territory. Let’s take a look at some of the common units in Alamein. Contrast typical Italian and British infantry battalions. Factors are attack-defense-movement, with morale on the right side of the piece. What appear to be minor differences in strength and morale are in fact significant and make the British battalion a far more effective unit. Contrast the British unit with a German infantry battalion and note the even greater strength and higher morale of the German. Armored units use the same factors, with an armor rating in the upper right corner. While the German here is markedly superior in all categories, the British possessed tanks in such numbers as to be able, eventually, to offset German superiority. These are only examples; each country had far more effective units. In artillery the British must be acknowledged as the leader. In armor the Germans reigned supreme. But the values on the units are not the only measure of a unit’s combat value. Quantity is also important and here the British had the edge. While the two sides had approximately the same number of formations, the typical British infantry division has nine infantry battalions while an Italian or German division had only six. Axis numerical inferiority grew as the campaign progressed, and the quality of individual units was relied on more and more to counter growing Allied superiority in men and material. The availability of artillery ammunition made a significant difference. While in the end it was decisively with the British, this was not the case in June 1942. The ability to replace losses is critical to an army’s ability to sustain their forces in the field while conducting active operations. In the end the player who most effectively uses his forces will achieve his objectives. The formations which participated in the battle probably included more nationalities than any other battle of similar size, especially those in the British Eighth Army. In the Eighth Army was a New Zealand Infantry Division, the toughest Allied formation in the game. Almost as tough, the 9th Australian Division proved to be a key element in the ultimate Allied victory. In the opening of the battle the 1st South African Division was all that stood between the renamed PanzerArmee Afrika and the Nile. Individual Indian brigades fought in several divisional formations during the beginning and middle of the campaign, suffering heavy casualties. The British provided three infantry divisions, the 44th, 50th and 51st. The first did not survive the battle, not as a result of casualties but rather the need for infantry in the armored divisions; the second never fought as a complete division, having lost a brigade at Gazala. Of the four armored divisions, only three were every really full-strength and their tanks suffered nearly disastrous losses more than once. Smaller formations of the Greek and French forces in exile fought at Alamein. Containing only two nationalities, the Axis order of battle included a wide variety of units in terms of capabilities, being both the weakest and strongest formations in the field. While the Italian Army provided the bulk of the Axis nonmotorized infantry formations, these were generally the weakest in real strength, being poorly armed, largely immobile and possessed of low morale. As a result they often proved incapable of resisting strong Allied attacks without assistance from other arms. Other Italian formations were better armed and more capable, although each was composed of only two regiments. Italian armored and motorized divisions proved equal to the task until so weakened by casualties that they were unable to hold the line. Last but certainly not least are the Folgore, Italy’s first parachute division. Although weak in numbers, it was an elite formation that more than held its own. The worst of the German units was the 164th (Afrika) Infantry Division, a late arrival to the desert and the single Axis formation that contained nine infantry battalions—and it was better than the average Allied division. The German mobile formations were weaker in numbers than Allied infantry divisions, but were especially powerful in the attack where their mobility allowed them to outmaneuver the British and their tanks allowed them to overrun all but the strongest position. Better at taking ground than holding it, the two German panzer divisions participated in every significant Axis attack. Alamein includes six scenarios covering portions of the battle and a campaign game covering the whole of it. The smallest scenario is "Tel el Eisa," an attack by the 9th Australian Division designed to capture two small hills along the coast. The largest scenario is "Operation Lightfoot," which covers the British attacks that finally broke the Axis line. Other scenarios include the fight at Mersa Matruh before Alamein, the first attack on the Alamein line, and the battle of Alam el Halfa. The campaign game begins on the 29th of July and continues to the 9th of November. It starts with the Axis attack at Mersah Matruh and ends (presumably) with the offensive to break the Axis defensive positions and force their withdrawal west. Players will find that operations are planned around divisions, even if multiple divisions are involved. The game rewards concentration of firepower and shifts of combat odds (from armor, regimental/brigade integrity and leaders), and the planning necessary to achieve them quickly and effectively. On the defense, minefields and artillery and anti-tank support are key, along with regimental and brigade integrity where it is possible. Operations must be planned around limits to artillery ammunition and replacements. Alamein was a grim struggle for victory in North Africa that would give one side control of an entire theater of war and cripple the loser (the British loss of the oilfields further east would have been disastrous). The British had to desperately hold on in the beginning in order to build up and counterattack in the end. The Axis had to win in the beginning or just as desperately hold on in the end. The real test is in how each side manages to fight so that winning (or losing) the battle today does not result in defeat tomorrow. Click here to order Alamein right now!